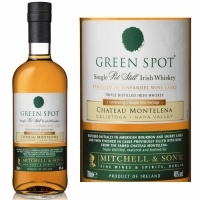 Green Spot Chateau Montelena, the first Single Pot Still Irish Whiskey to be finished in French oak Zinfandel wine casks. Matured until the combination of wine, whiskey and oak has reached the perfect balance. Green Spot Chateau Montelena has been initially matured in American Bourbon and sherry casks and then finished for one year in casks previously filled with Zinfandel wine from the famed Chateau Montelena, Napa Valley. This rare cask finish contributes pomegranate, cranberry and maraschino cherry on the nose, a dry note to the silky mouthfeel and the finish combines classic long pot still spice flavours with a delicate wine influence, all in perfect harmony.